Many teenagers experience difficulties with depression that can negatively affect their relationships, productivity in school and overall ability to function. Unfortunately, many of these adolescents go unidentified and, therefore, do not receive services to meet their needs. For this reason, the American Academy of Pediatrics has promoted primary care as an essential setting to identify and manage adolescent depression, with its most recent guidelines recommending depression screening at all well visits starting at age 12. Despite these recommendations, studies indicate that between 2005 and 2010, less than one percent of adolescents were screened for depression during primary care visits. In light of these challenges, there have been a number of innovative strategies that aim to enhance the feasibility and effectiveness of identifying adolescent depression in primary care. After implementing a universal depression screening for youth ages 12-17, about 25 percent of youth had elevated symptoms of depression scores on the PHQ-9-M. Starting in 2011, Children’s Hospital of Philadelphia (CHOP) began conducting electronic screenings using the Patient Health Questionnaire – Modified for Teens (PHQ-9-M) to identify depression in primary care practices. CHOP integrated the PHQ-9-M into the electronic health record (EHR). At first, this initiative focused on adolescents attending their age-16 well-child visit, but CHOP recently expanded the program to include screening at all adolescent well visits. Feedback from the PHQ-9-M is provided to the primary care provider through the electronic health record, and the provider discusses these results with the patient and documents a follow-up plan when needed. Our team analyzed the PHQ-9-M data from age-16 well visits from 2014 to 2016 to examine rates of screening across CHOP’s 31 primary care practices, calculate the percentage of adolescents with elevated depressive symptoms and better understand the follow up that these adolescents received. Several results from this study are notable. At practices using the PHQ-9-M, providers screened 76 percent of adolescents who attended their age-16 well visit. This is a considerable increase from the rates seen in national surveys and demonstrates that screening is feasible to implement when these tools are incorporated into the EHR and there is an organizational recommendation to screen. Furthermore, one-quarter of adolescents screened had elevated scores on the PHQ-9-M in either the borderline or threshold range and only 22 percent of these adolescents were already receiving treatment. This indicates that the screening successfully identified adolescents with depressive symptoms who might benefit from services. 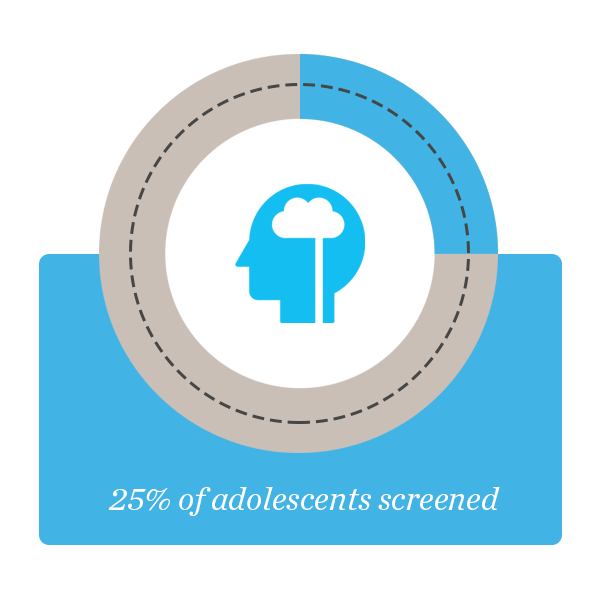 Many of these adolescents received referrals for mental health services immediately after the screening and in the following year, and a large number also received active support and monitoring from their primary care providers. While our primary care providers are doing an excellent job supporting these adolescents, our findings suggest that they would benefit from additional support to connect adolescents with timely, high-quality services. Recently, CHOP instituted depression screenings at all well-child visits starting at age 12. We plan to examine these data to see whether the rates of screening, elevated scores and follow up continue as this screening expands to more adolescents. Moving forward, it is imperative to ensure that youth identified with elevated symptoms of depression receive appropriate and timely care. For this reason, we are looking at ways to promote integrated care for adolescents with more significant depression and are examining the feasibility and effectiveness of delivering depression prevention programs in primary care for adolescents with borderline PHQ-9-M scores. We hope that these initiatives will not only identify adolescents in need of services, but will provide an opportunity for these adolescents to receive services that meet their unique needs in primary care. The Children's Hospital of Philadelphia, PolicyLab. Screening for Depression in Primary Care Settings [online]. Available at: http://www.policylab.chop.edu [Accessed: plug in date accessed here].